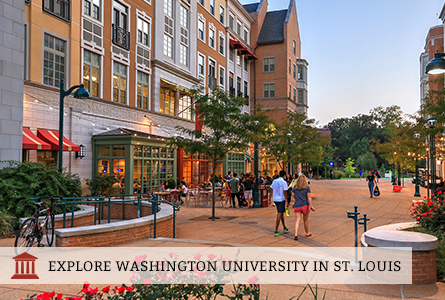 Washington University in St. Louis offers 1,500+ courses and 90+ fields of study within five undergraduate divisions (Arts & Sciences, Architecture, Art, Business, and Engineering). Whether you choose a traditional path or pursue your interests across disciplines, the faculty will inspire your intellectual, personal, and professional growth during your time at WashU and beyond. The Gephardt Institute for Civic and Community Engagement cultivates informed and actively engaged citizens. Community service is a natural part of life at WashU, with approximately 60% of students engaging in a wide range of service projects. About 80% of undergraduate students at WashU pursue multiple majors, minors, and/or degrees. When selecting their field(s) of study, first-year students can turn to their professional four-year advisor or to upper class leaders known as Washington University Student Associates (WUSAs) to answer questions about academic deadlines and policies, resources available, and making the transition to college. The student-to-faculty ratio is 8:1 and 76% of classes have fewer than 30 students. Over 50% of undergraduate students participate in research. Twice a year, the Office of Undergraduate Research presents the Undergraduate Research Symposium. This is a forum for students to present their research findings and a celebration of the diversity of research that takes place at WashU. About 40% of WashU undergraduates in all divisions learn through study abroad opportunities and internships in more than 50 countries each year.